Dave Grohl made a majestic return on the 4th of July, performing on top of a custom-designed throne at a Foo Fighters concert in Washington D.C.
Last month, Grohl broke his leg after falling off stage, which resulted in several canceled tour dates. But the constant diet of painkillers provided some unexpected inspiration, leading him to dream up a blueprint for his throne while under the influence of morphine and Oxycontin. Grohl’s drug-induced invention bears a resemblance to another famous throne – the one from HBO’sGame of Thrones – but swaps out swords for guitar necks and throws in some “lazers [sic] and s***” for good measure. And somehow, despite wearing a purple cast and having to stay seated, Grohl and the Foo Fighters were still able to rock out - delivering a 24-song set. And at one point, he even took a break to bring his mom out onstage, dedicating the song “For All The Cows” to her – maybe not the best song title for a dedication, but a sweet gesture nonetheless. Grohl, his brand-new throne, and the rest of the Foo Fighters are back on track for their tour and have dates scheduled across the country and Europe through November. For a guy who says he's not returning to Game of Thrones, Kit Harington is sure dropping some hints to the contrary. Over the weekend, Harington, who was killed off of the Season 5 finale, was at Wimbledon sporting his very Jon Snow-like hair. While this might not normally be cause for concern -- or in our case, hope -- he did recently tell Vulture he was planning to shave the beard now that he's done with the role, but might keep the hair for other roles. But look at the photos and there's still very much a beard paired with his long, luscious locks. To further add to the speculation, just last week,Emilia Clarke, who plays Jon's rumored auntDaenerys Targaryen, told MTV News that there's hope that the Lord Command will return in Season 6, which is scheduled to start production later this month. "If I had to bet, I'd say there's a 50-50 chance," Clarke said in this video interview. "I mean, there's some helpful people there who could bring him back to life," Clarke said. Check out the side-by-side photos below and share your theories! A bassist calls for equal treatment under metadata. "We want to know who's playing the music we're hearing, who produced it, who arranged it, where it was recorded and by whom,” reads the MoveOn petition page for ‘Show the Album Credits on Apple Music!’ Bassist Jon Burr launched the campaign yesterday (July 5), following the explosive launch week of Apple Music, which garnered many positive reviews, particularly around the service’s free Beats 1 international radio station. "We chose to target Apple at this time because the rollout of Apple Music is missing this category of information," the petition's creator, Jon Burr, tells Billboard. "Apple has shown a willingness to listen to feedback in the past, and is sensitive to their user base (which contains many of these same creatives). As the leader in technology and music marketing, if they set a trend, others may follow." Metadata is a problem that has plagued the digital music space for years, suffering from a lack of standardization around music files and their internal cataloguing of contributors to the work they contain. The lack, or incompleteness, of metadata can adversely affect artist payouts as well -- if the robot doesn't know where to look, if doesn't know which palm to place the penny. "We understand that doing this will create a burden on these services -- many just don’t have access to the information due to the way digital music is delivered to them," says Burr. "If we can encourage a cultural shift going forward and develop enhanced supply chains, we’ll be making the kind of progress needed by musicians, composers, lyricists, engineers, photographers, designers, and other contributing creatives." Spotify and Pandora, Apple Music’s biggest competitors, do not list comprehensive credits either when songs are played. Recordings within YouTube that have been scanned into the company’s “sort-of-switched-on” (still in beta) Music Key program do list label, publisher, composer(s) and performers (as in this Percy Mayfield recording). Spotify refused to comment for this report. A request for comment from Pandora wasn’t immediately returned. In the days and weeks after its launch last April, one of the biggest curiosities surrounding the Apple Watch was its tolerance to water. Thanks to a few initial tests -- from showers tohigh dive pools -- we now know that the Apple Watch is indeed a bit more waterproof than Apple promises, and with that in mind a few London-based iOS developers have created the "World's first swim app on the Apple Watch," and put it through its paces in a new video. Having designed a similar app for the Pebble, Ted Bradley and his team decided to take that idea -- a lapping, time, and heart rate monitoring swim app -- and transplant it onto the Apple Watch. The developers put each smartwatch to the same test, swimming four full lengths of the London Aquatic Centre's 50 meter pool. The test proved successful, with the Apple Watch mirroring the Pebble's results of a four lap, 200 meter swim. Apple's smartwatch even continued to measure heart rate successfully, raising from an initial 88bpm to 138bpm immediately after the test finished. The only downside for the app is that the Apple Watch experiences a tiny bit of lag when waking it up to check out lap times, the developers explaining that only when the screen is awake can the app run through the data samples collected from the swim and take a few seconds to parse through the information and display it on screen. Elsewhere, the swimming data isn't locked into the app, all of the workout and heart rate information getting delivered to HealthKit like any other workout and adding to a user's daily exercise and move goals. Of course, even though the app works, the developers are still referring to it as an "interesting technology demo," seeing that App Store Guidelines will immediately shut it down for encouraging users to use the Watch "in a way that may cause damage to the device." In the end, the app's creators just hope that Apple hears the calls for a fully-waterproof smartwatch and includes such features in the device's next generation. We really hope that Apple see the demand for an official, fully waterproofed Apple Watch. Once that is available, we’ll be able to ship a fully featured swimming app. In the mean time, it would be great to see swimming become a first class citizen in the Apple Health and Activities apps. Running and cycling both have their own distance graphs you can view in the dashboard whilst for swimming you have to drill down to individual workouts. Although you can’t swim with the Apple Watch, many people swim with other devices as well as logging their swim workouts manually on other apps. If there is a future ambition for Apple Health/HealthKit, Apple Watch, the new Activity app and ResearchKit to all tie up and tell the narrative that "Apple user's live longer healthier lives", then recording all fitness activity, including swimming, is a must. The full blog post, where Bradley goes into detail about everything from his inspiration for creating the swim app to architectural challenges the team faced in creating it, is definitely worth a read. For months, reports have said that Apple is preparing to release a larger iPad this year, perhaps called the iPad Pro. While Apple has yet to confirm any plans regarding its future products, Business Insider has learned that Apple has been testing prototype iPads with bigger screens since as far back as 2012. An iPad prototype from around that time had a screen that was larger than 12 inches, according to a person familiar with the matter. Various reports have indicated that the so-called iPad Pro will have a screen that measures 12.2 or 12.9 inches in size, which would make it significantly larger than Apple's current 9.7-inch iPad Air 2. For context, a 12.9-inch iPad would be about the same size as the screen on a 13-inch MacBook. A 12.2-inch iPad would be about as large as Samsung's Galaxy Note Pro. We're told this prototype from years ago was bare bones, and that Apple was likely running basic tests just to gauge how an iPad of that size would work and what kinds of use cases would be possible. If Apple is preparing to release a larger iPad soon, the final version will likely be much different than the prototype spotted around 2012. The new size option could help the iPad climb out of its sales slump as it might make it a better PC replacement in businesses. In an earnings call from January, Apple CEO Tim Cook already started subtly laying the foundation for why an iPad Pro would be necessary. On the call, he talked about how there's room for Apple to innovate in the workplace, especially now that it's partnering with IBM. "And so the real opportunity is to bring mobility into the enterprises and change how people work," Cook said on the call. Apple also recently added new features to the iPad that are meant to take advantage of its larger screen, such as the ability to view more than one app at a time on the iPad's display. Another new capability allows you to use the iPad's keyboard like a giant touchpad when you want to move the cursor around in an app such as Notes. Features like these, which will debut in Apple's ohiOS 9 update this fall, could be even more useful on an iPad with a larger display. Other than a bigger screen, some reports have suggested that the iPad Pro could come with a stylus and a slightly different design. Apple typically unveils its new iPad models in October, so there's a chance we could see the iPad Pro launch later this year. Apple has not responded to Business Insider's request for comment on this story. Apple’s next big thing is expected to launch on July 14 when the company will introduce Apple Pay support in the UK, reports claim. Think different I understand US readers may instantly lose interest in something taking place outside of their continent, but Apple Pay will be supported at 250,000 locations across the UK and there are several reasons why the launch matters. Mobile payments Apple has seized a strong position in mobile payments in the US – quite an achievement when consumer sentiment concerning contactless payments in that country was reluctant in comparison to consumer perception elsewhere. Partly as a result of years of industry agitation, European consumers are far happier to embrace contactless payments, with UK consumers particularly ready to embrace these. With Apple’s iPhone 6 series devices leading the pack in terms of smartphone sales in Europe, there’s little doubt that you can predict many thousands of customers will test Apple Pay. The existing £20 payment limit is likely to climb to £30 by the end of 2015, but does mean UK consumers will use an iPhone or Apple Watch to pay for smaller purchases and mass transit fares. TFL is a partner The UK’s capital city, London, has at least 6 million residents that are already accustomed to using contactless technologies to pay their subway and bus fares. Mass transit there is run by Transport For London who has said it will accept Apple Pay. With 24 million journeys taken across London daily, this makes it possible for Apple Pay to become part of London life very fast. And this is also likely to boost Apple Watch sales. Think of the data When it comes to TFL, all those iOS device payments will become an opportunity for various kinds of app-based services and in-device data collection toward the mass transit authorities big data efforts. Now, we already know Apple will anoynmize its data, but it isn’t too hard to imagine TFL introducing customer loyalty apps – so you may purchase tickets using Apple Pay and the TFL app, and in exchange for sharing a little more data you may find your ticket price reduced to match daily, weekly or monthly travel card deals. Most retailers should offer in-app payments such as these as when you choose to use them you will also be asked to share more data. You won’t have to use them, but the convenience may sometimes outweigh privacy concerns – though Apple gives you that choice. Apple Pay UK initial partners list includes: TfL, the Post Office, the Trainline, Lidl, M&S, Nando's, Boots, Costa, McDonald's, Waitrose, Wagamama, Pret, Spar, BP, JD Sports, Subway, KFC, and Starbucks. (A memo purporting to be from Waitrose is what told us to expect a July 14 launch, for example). In future you expect them to tie loyalty discounts up to Apple Pay transactions, including provision of Wallet loyalty apps, while collecting your data in the same way current loyalty card systems do. (In future, of course, as iBeacon support is rolled out in retailers on a global basis, you’ll get the chance to be saturated with special offers and loyalty discounts through your phone for your convenience – though only those retailers who do so without annoying consumers truly stand to benefit from this aspect of the digital transformation of customer facing retail.) What’s next? Apple will introduce Apple Pay support in other countries in due course. Plans for launch in China are thought to be falling into place, and, of course, across the rest of Europe. It seems inevitable the company will also launch in Africa, India and South America, where mobile payment systems are incredibly popular. Once Apple launches in multiple countries it will have new opportunities to hack other profitable slices of business away from the deeply mistrusted financial sector, including foreign exchange payments, direct person-to-person payments – even the chance to offer crowdsourced loans. These opportunities can only be enhanced by its growing global reach. A lot of activity has taken place in the wearable devices (wearables) world in the last few weeks. Fitbit went public. Jawbone is suing Fitbit. Apple Watch went on sale (for real, this time). If you read the tech news, it might feel like the technology industry is working relentlessly to make you healthy. However, what we are seeing is a small step in a long journey toward changing people’s habits and adapting the healthcare system to new technologies before this technology can enable us to live healthier lives. Broadly, wearables fall into two categories – medical and consumer. Medical devices require FDA (a US government agency) approval to be used and consumer devices do not. Non-medical devices companies and startups tend to focus on consumer wearables because it is an easier thing to do. Who wants to wait two or more years to see if what you are building will get approved by a government agency? Apple Watch and Fitbit both fall into the consumer wearables category. However, they are very different devices. Apple Watch is an accessory to the iPhone and can do a lot of things in addition to tracking your health. Fitbit’s wearable are mainly focused on tracking health although they have a few products that do other things like tell you when you get a phone call and offer the ability to read text messages on your wrist. Apple Watch has been a disappointment. As I wrote last year, on my personal blog, Apple Watch is a triumph of function over form. Now it is in the market, we know that even the function is dysfunctional. Apple Watch eats up your iPhone battery and people were worried about the watch’s battery life. The digital crown is not even close to the iPhone multi-touch interface in its intuitiveness. It is hard to see the actual time on the Apple Watch as the screen sometimes does not wake up with hand movement. The map function on the Apple Watch is difficult to use for walking directions. Having said all of this, the Apple Watch is the best smartwatch on the market. Does that make it a useful and pleasing artifact to wear on your wrist? The most innovative thing Apple Watch offers is the bands for the watch. How they look and integrate with the watch photograph really well. Is that enough for you to buy one? Apple made the phone easier to use and now it is making the watch more difficult to use. Apple Watch will never achieve the adoption that iPhone has achieved. Fitbit is another story. Most of the products are simple and focused on activity tracking which basically means how often you move physically. However, with six products on the market, the brand lacks clear positioning. And, sooner or later they will face inventory management issues. Is Fitbit a fashion thing or is it a fitness thing? Having Tory Burch making Fitbit bracelets and Hollywood celebrity endorsements seem like they are more inclined towards Fashion. However, the Fitbit band does not look chic or sleek or cool. A company whose stated mission is “Fitbit helps people lead healthier, more active lives by empowering them with data, inspiration, and guidance to reach their goals”. It defines a paid active user (see S1 page 57) as someone who has taken 100 steps in three months. How ironic? If I am reading the S1 correctly, 39% (4.2M) of people who bought a Fitbit in 2014 did not use it in last three months of the year. People buy the product and more than one third stop using it within a year or less. Given these data points, at $8.7B, the company is way overvalued. As neither fish nor fowl (fashion accessory nor healthful device), Fitbit must quickly find its true raison d’etre in the marketplace to justify its enormous valuation. Apple (NASDAQ: AAPL) is currently valued at 15 times trailing twelve months earnings and Fitbit (NYSE: FIT) is currently valued at 90 times trailing twelve month earnings. 39% of Fitbit customers stop using the product within a year. Imagine where would Apple be if 39% of customers stop using their iPhones within the first year. For Apple, Apple Watch won’t effect the company earnings that much. And somehow, Fitbit stock is trading at six times the earning multiple of Apple. This is insane. The real change in behavior will come when all the physical activity data we are generating gets integrated with our healthcare system and we start measuring inputs (food, air, environment, etc.) into our body and mental health in addition to output (physical activity). 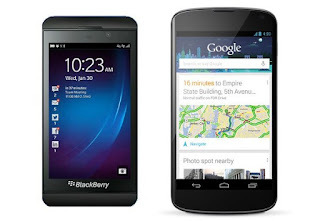 Here are 5 reasons why the Blackberry 10 smartphone is seen as a better option over the android smartphone. 1. Multitasking: On Blackberry 10, any app can be instantly minimized with the swipe up gesture and is then accessible as a small file on a separate screen. 2. BlackBerry Hub: The Blackberry 10 has a dedicated hub that unites all your text messages, IMs, emails, social network feeds, call records, etc., in one centralized place, thereby making it easy to get all your notifications in order, read, and respond how you want. 3. Search: In BB 10 OS, you don’t have to open up a dedicated search apps, just start typing your desired term from the home screen and the search window opens up automatically. 4. Notifications: On BB OS 10, all new incoming messages and notifications are shown momentarily. This works with all apps including games. Android provides the same functionality, but they don’t work well with all apps. The blackberry 10 has a better notification access than its android counterpart. 5. Security: With Android phones, if you forgot your password all you need do is to get the phone flashed to bypass the security lockscreen. The same can’t be done on BB OS 10. The blackberry 10 OS is more secured than the android OS. Since the android OS is an open source, it can be easily tweaked or customised, making prone to virus and easy to hack. Installing apps is easy on Android. So easy that you can end up with a ton that you don’t need over time. Rather than tediously paging through every app to uninstall them one by one, we recommend Easy Uninstaller. This app allows you to uninstall several apps at once, sort them by size, and even clean up any junk files left behind. Even without all the bells and whistles, Easy Uninstaller does its fundamental job well. You’re presented with a list of apps, as well as how much storage space they’re taking up on your phone. Simply check the boxes next to the apps that you want to uninstall and Easy Uninstaller will run through them, one by one. Due to the way Android handles app uninstallations, you’ll still need to confirm each one individually, but the process is much quicker than going through the usual Settings app. Easy Uninstaller will even keep a history of the apps that you uninstall if you want to find them again. The extras make it stand out, however. You can set the app to remind you on a regular basis, such as every week or month, to clear out unused apps. Alternatively, you can get a reminder when your free storage space drops below a certain percent of your total storage. You can also use the built in tracker to find out which apps use up your battery, or which apps you use often enough to keep. While the battery and usage trackers are handy, they can themselves be a battery drain. While this might be useful occasionally, chances are you already know which apps you use regularly. Android also has its own battery usage tracker, so this feature is a little redundant. It also can’t uninstall or disable any system-level apps that come preinstalled on your device. You can disable them through the Settings app, but it’s still the normal hassle. While Easy Uninstaller is more than serviceable for the non-rooted crowd, if you’re a root user,Titanium Backup is handy to have around if you have root access. In addition to the usual backup features, it can also uninstall system-level apps if you want to get rid of any carrier-branded junk or bloatware. Outside of root apps, most of the competition around app uninstallers is less about doing batch uninstalls better, and more about which app has the least junk. For example, Easy Uninstaller advertises a “virus scanner” which you probably don’t need, though the other extras it has still push it to our top pick. On the other hand, Uninstaller can also batch uninstall apps without any extra frills and also doesn’t pack any extra crap features or “offers.” System App Remover similarly can uninstall system apps, though if you’re using Titanium Backup, it’s a bit redundant. Prolific mobile custom ROM developer community AICP (Android Ice Cold Project) has released a new firmware to the Google's 2012 flagship smartphone Nexus 4. According to Team Android, this new AICP custom ROM is based on the latest AOSP (Android Open Source Project) v5.1.1 Lollipop OS. It is said to be stable and bring performance enhancing tweaks to the phone. Installation of custom ROM requires clearing of memory on the smartphone, so make sure to back up all the data by installing Clockwork Mod (CWM) Recovery/ TWRP in the smartphone. Make sure to install USB drivers on the PC, or else your phone (Google Nexus 4) smartphone will not be recognised by the computer. Make sure your device has more than 80% battery, or else there is chance of smartphone getting temporarily bricked if the installation process is interrupted mid-way. Though installing custom ROM improve the device's performance and UI experiences, it makes the company warranty void and they will no longer be liable to provide updates in future [users can restore warranty by flashing the device with stock-ROM]. Step 1: Download AICP Android v5.1 Lollipop Custom ROM (HERE) and Google Apps (HERE) in the PC. Step 2: Connect LG-Google Nexus 4 (aka Mako) to PC via USB chord. Step 3: Place Android v5.1 Lollipop ROM zip file and Google Apps .zip file into the phone's memory. [Note: Before users begin installing the custom software, make sure the device is already rooted and must have installed ClockworkMod Recovery/TWRP]. Step 4: Turn-off the device and disconnect from the PC. Step 5: Perform the regular 'Bootloader Mode' sortie by press holding 'Volume up', 'Volume down' and 'Power' buttons. Step 6: Once entering the 'Bootloader mode,' go to the ClockworkMod Recovery mode, then clear phone memory, by choosing 'wipe data/factory reset' [Note: Use 'Volume' keys to navigate and 'Power' button to select options, while operating under Recovery Mode]. Step 11: Once done with the installation process, navigate to '+++++Go Back+++++' and re-start the device by opting 'reboot system now' seen in the recovery menu. Now, your device (LG-Google Nexus 4) will take a few minutes to complete the booting process. Users then head to Settings >> select 'About phone' to confirm the installation of AICP Android 5.1.1 Lollipop custom ROM.